DUMBARTON were the happier side after an exciting and competitive 0-0 draw with Raith Rovers at Starks Park. DUMBARTON were the happier side after an exciting and competitive 0-0 draw with Raith Rovers at Starks Park in front of a 1,400 crowd. Before the match players and spectators took part in one minute's applause in tribute to Dumbarton chief executive Gilbert Lawrie, who died suddenly earlier in the week at the age of 55. The match was uncompromising. 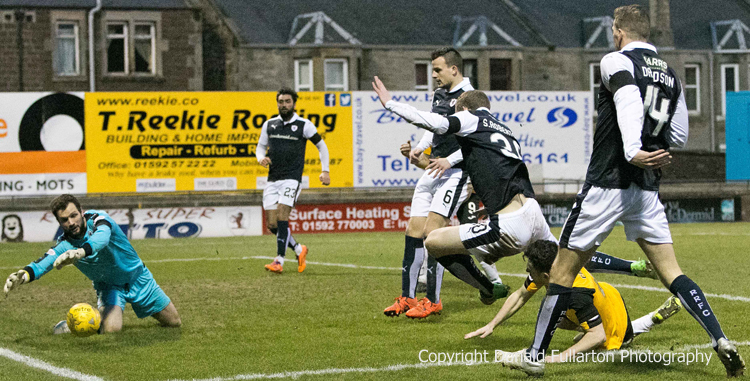 Raith had the bulk of the possession, but Sons looked threatening on the break. New on loan signing from Rangers Tom Walsh had a good debut on the wing, while Kevin Cawley and Grant Gallagher always looked dangerous. The visitors had to survive intense pressure in the final minutes, with keeper Jamie Ewings, Frazer Wright and Gregor Buchanan keeping cool until the final whistle. The picture shows keeper Kevin Cuthbert saving from Kevin Cawley.